A variety of ministry assignments have enriched Father Stephen Jarrell’s life as a priest, but his most memorable pastoral experience may have been when his parishioners ministered to him. Surviving a serious car accident three years ago taught him personal lessons about surrendering to God and accepting help from caregivers—important life lessons which have strengthened his pastoral ministry. 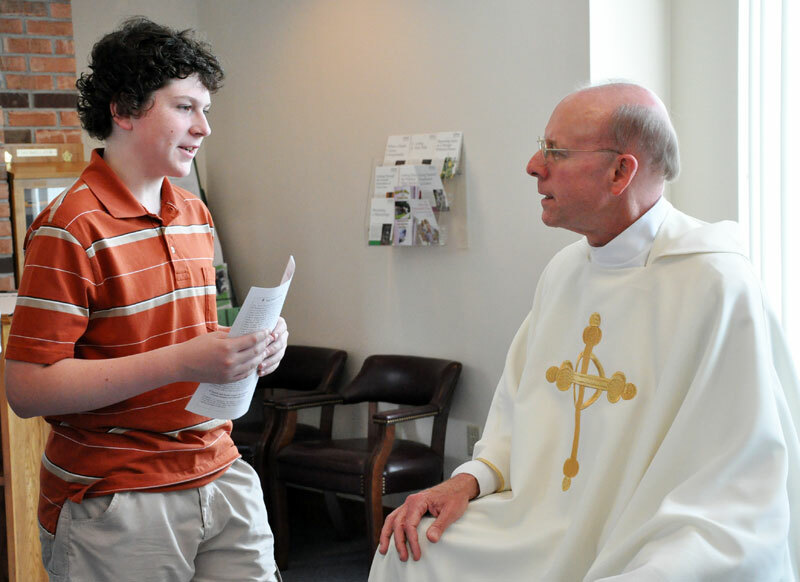 Since his ordination to the priesthood 37 years ago, Father Jarrell has ministered at eight parishes and served as the first director of the archdiocesan Office of Worship for 17 years. He was the founding pastor of SS. Francis and Clare Parish in Greenwood as well as the Catholic chaplain at DePauw University in Greencastle and the Putnamville Correctional Facility. But serious injuries sustained in an automobile accident on Jan. 8, 2007, left him unable to walk for several months and required considerable recuperation time away from his ministries as the pastor of St. Paul the Apostle Parish in Greencastle and Annunciation Parish in Brazil. For five months following the accident, Father Jarrell was not able to minister to parishioners, collegians and prisoners while his body healed from a painful fractured sternum, injured lumbar vertebrae, several broken ribs as well as multiple shattered bones in his right ankle and foot, which required metal plates and pins for stabilization. He couldn’t stand at the altar to consecrate the Eucharist during Mass. He couldn’t administer the other sacraments. He couldn’t help people in need, which he enjoys doing as part of his priestly duties to serve God and the Church. All he could do was rest, recuperate and rely on staff members and parishioners to help him with daily living needs or transportation to doctor’s appointments and rehabilitation treatments. Father Joseph Kern, the dean of the Terre Haute Deanery, and six other priests covered the Masses and sacramental needs at both parishes during his recuperation. Recalling those challenging months, Father Jarrell said recently that the good news is he had plenty of time to pray. Three years later, a slight limp while walking is the only indication that Father Jarrell’s life could have ended in an early morning crash near Greencastle when a young man driving a pickup truck fell asleep and his vehicle crossed the center line then struck the priest’s car. In July, Father Jarrell began his new ministry assignment as the pastor of Christ the King Parish in Indianapolis. He briefly mentioned his injuries in a letter published in the parish bulletin. Looking back on that cold winter day, Father Jarrell told The Criterion that he was driving south on U.S. 231 near Greencastle at about 9 a.m. on Jan. 8 when a north-bound pickup truck hit his car head on. Following emergency treatment at the Putnam County Hospital in Greencastle, the doctors decided to transfer Father Jarrell to Methodist Hospital in Indianapolis for surgery. Following two surgeries at Methodist Hospital, Father Jarrell was admitted to the Rehabilitation Hospital of Indiana in Indianapolis for further treatment. When he was finally able to return to the St. Paul Parish rectory, parishioners were eager to help provide extended care for him. A large basket in the rectory living room overflowed with “Get Well” cards from St. Paul and Annunciation parishioners—visible symbols of their love and prayers for him. “I am convinced of the power of prayers because the doctors were very surprised about the progress I was able to make at the Rehabilitation Hospital,” he said. “… It was certainly a life-changing experience for me. I have learned a lot through this whole experience of suffering and physical limitations. … I counted my blessings, and I knew that I would be able to walk again at some point. Members of both parishes delivered meals. His bed was carried downstairs in the rectory. Eucharistic ministers brought him Communion every day. He was finally able to celebrate Masses again with parishioners in Brazil and Greencastle in May of 2007, but later had to relinquish his second pastorate at Annunciation Parish for health reasons. “This has been the most close-knit parish that I have ever been a part of,” Father Jarrell said about the St. Paul Parish family, who he believes grew stronger as a faith community by helping him during his months of recuperation. When Father Jarrell received his new assignment as pastor of Christ the King Parish in June, St. Paul staff members and parishioners organized a farewell reception for him on June 27. At the party, another large basket—this time filled with “Best Wishes” cards—sat on a table as parishioners lined up to say goodbye to their beloved pastor. Betty Lancaster, the administrative assistant in the parish for 23 years, said it’s always hard to say goodbye to a priest when he is reassigned to another parish, but St. Paul parishioners grew especially close to Father Jarrell as their pastor and friend because of his injuries.